This one-hour VHS video documents a woman who dedicated her life to health and social activism in the 1900s. This video is being sold by the University of Washington, School of Nursing Section through the Washington State Public Health Association. Purchase Lillian Wald: At Home on Henry Street online. ($27.00 includes shipping and handling). To purchase a copy of this video by check or submit a Purchase Order, please print the Lillian Wald Video Order Form and mail your check or purchase order to the address on the form. Purchase orders will be invoiced and merchandise will not be shipped until payment is received. This video will be shipped out from the University of Washington in Seattle, Washington. Please allow 7-10 business days for delivery. This 30 minute video continues to be used in university nursing programs around the country. This documentary program is dedicated to American public health nurses and to the individuals and families with whom they work. 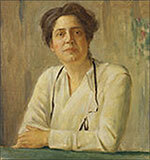 It celebrates the extraordinary stories of health professionals who often go unrecognized, but who, for the past century, have met the public health needs of their communities by going to the people. 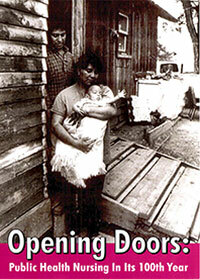 Purchase Opening Doors: Public Health Nursing in Its 100th Year online.